The fashion weeks might be over for this time, but there’s still a lot of material to go through. I wrote about the beauty trends fall 2019 yesterday and an article on the fashion trends fall 2019 will come up soon! 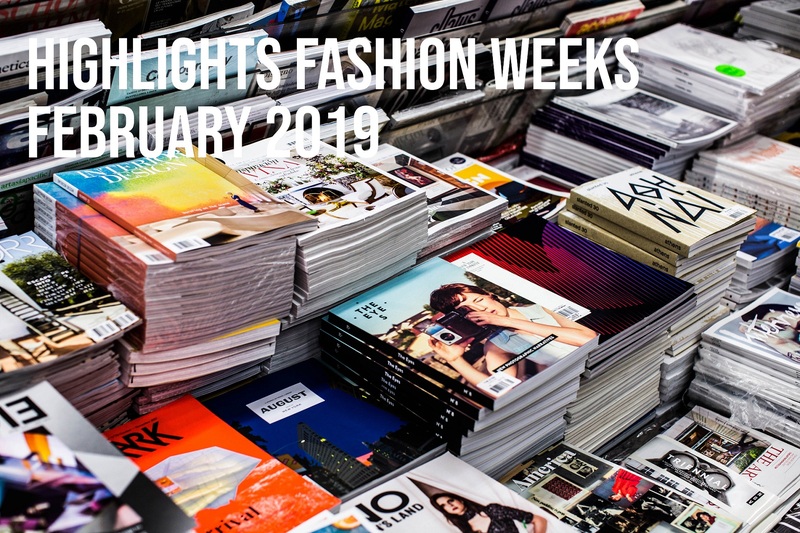 Before that though, I have some highlights from the fashion weeks February 2019 that I’d like to share. I have several looks I’d like to highlight, so let’s do a part 1 and part 2 in this series. And don’t forget to read more articles from the fashion weeks here! First out is this Gucci look! How you can tell that it’s Gucci instantly, is the elevated styling with the combination of socks, yellow shoes, yellow glasses, ear accessories (? ), bracelets, lace gloves and a mismatched bag. What I like about this outfit though is not the accessories but the jacket. It’s completely brilliant. In a way, very British and 1940s with its grey hue, structured lines and matchy skirt, but also contemporary with the layered fabric. The enhancement of the shoulders is what makes this look unique. The layering itself is pretty interesting as the round shape gives the harsh lines a more sophisticated look. It looks like an extension of a collar. This kind of fashion shows how classic wardrobe staples can be done in more statement ways! And speaking of collars, how pretty isn’t it done with this purple/red dress from Erdem fall 2019? Love the reconnection with the cuffs’ of the sleeves, creates a nice cohesivity in the outfit. The bold color combination is also pretty good and is in line with the preppy and soft look of the dress. I think the black bows creates an intensity in the dress which makes the look more interesting. The hat and the choice of shoes/socks are perhaps a bit of a mismatch, but works well as they match the bows! Also note the transparency in the fabric. It makes the heavy color combination more wearable and perhaps likable. I know the two previous look might have been a bit bold for everyone’s liking, but this one is pretty easy to appreciate if you ask me. The simplicity of the the shoes and the lace dress with the powder pink color makes it rather relatable. It’s also very trendy to match one’s OTK boots with a shorter dress which gives the look a contemporary vibe. I think the delicate lace in the dress is nicely contrasted with the leather of the boots. The difference between the two materials makes the look more interesting compared to more neutral materials. Love how delicate this look is overall! If you ever question that a part of fashion is art, take a look at this creation from Dolce & Gabbana fall 2019. The motif of the cape is quite magical with the surrealism. Very glam with the sequins and even more glam with the golden print of the cape. The bow also makes the look more elegant as well as the tulle under the cape. Also love the choice of shoes to this look as the cape is pretty heavy but the shoes balances this with their light appearance. I love when fashion is done like this, artsy and completely different from what we normally see. Perhaps this is not that wearable, but every now and then some fashion magic must be allowed! Did you know that you needed a polka dot maxi cape? Well I didn’t know I needed one but I’m pretty convinced after this look from Balmain fall 2019. I absolutely love the way the cape frames the transparent top and the matching pants. It gives a chic attitude to the outfit as it adds structure and some respect with the, often, power associations a maxi cape creates. I like the studded boots too as they stresses the drama in the outfit and further enhances the attitude. Perhaps not that wearable either, but oh so chic! I love structured shoulders too. High victorian necklines are something that I really love seeing on others but not as much on myself! I’m living for those matching boots with lace dress from Blumarine! Have a great week! What the what is going on with those ear accessories? Very interesting. I love the bows on the Erdem dress too, and I love the Blumarine dress! The Dolce & Gabbana look is fabulous! I love that bold cape! These collections were all works of art- and yesssss, Gucci, please. And Blumarine! The prettiest! So many cool and unique looks this year!